Chimacum – 2:30 to 4:30 p.m.
Adolescence is a time of change and growth, the period of life reserved for rebellion and self-discovery! But as the demands in life increase for teens, they often experience more stress. Teen years can include anxiety and other strong emotional ups and downs. For many teens these challenges lead to feelings of disconnection or isolation at times. “Making Friends with Yourself” is designed to reduce stress, and increase the sense of feeling relaxed and in control. Through practices and exercises developed just for teens, they will have an opportunity to learn how to navigate the emotional ups and downs of life with greater ease. This class is for high-school age males, females, and other gender identities. If you would like to experience less stress, then this course is worth checking out. In research studies this program demonstrated a significant decrease in stress, anxiety and negative mood. This curriculum was adapted from the adult Mindful Self-Compassion created by Kristin Neff and Christopher Germer, and has been endorsed by Neff and Germer. The class will be taught by experienced instructors Blair Carleton and Macy Ratliff. Learn more about them and the class. Cost: $200 standard registration; sliding scale and scholarships available. Reduced fee for second parent/caregiver from the same family.No one turned away. $35 for CEUs. Learn how to develop a warm-hearted connected presence, even during challenging moments with your child. Mindful self-compassion for parents cultivates emotional strength and resilience. Develop skills to care for your children while caring for yourself. Suitable for parents of any age child, the program will include information on coping when things go wrong and the developing teen brain. Taught by Lorraine Hobbs, youth and family programs director of the University of California San Diego Center for Mindfulness, this class is also suitable for therapists and other adults who work with youth. Continuing education credits available for social workers and licensed mental health counselors for an additional $35 fee. Research shows self-compassion is strongly associated with emotional well-being, more satisfying relationships, reduced anxiety and depression as well as healthy habits such as diet and exercise. The Benji Project is offering scholarship opportunities to local individuals who want to train to teach our curriculum of mindfulness and self-compassion to teenagers. The scholarship is valued at up to $5,000, and applications are due April 19. Read more and download an application here. We encourage a diverse candidate pool including males, members of the LGBTQ community, veterans, the disabled, and minorities. A background working with youth in an education, healthcare, or other group setting is desired as well as a personal mindfulness practice. Please let your network know about this opportunity. Email cynthia@thebenjiproject.org if you have questions. Mark on your calendar these upcoming events, and see below for more details. 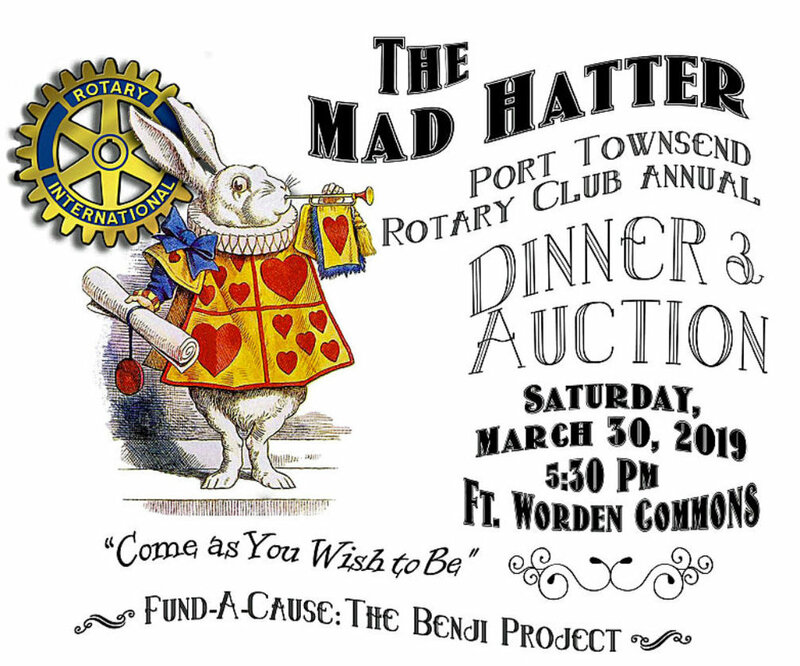 Don't be late for this very important date as Port Townsend Rotary Club holds "The Mad Hatter" celebration with The Benji Project as the fund-a-cause. This dinner with auction takes place Saturday, March 30, at 5:30 p.m. at Fort Worden Commons in Port Townsend. Enjoy a fabulous evening and support Rotary's good works. Get tickets here. The Benji Project will offer "Mindful Parenting," a weekend workshop on April 13 and 14 at Jefferson Community School, 280 Quincy St., Port Townsend led by Lorraine Hobbs of University of California San Diego's Center for Mindfulness. Cost is $200 per participant with sliding scale starting at $100. Discount for second parent/caregiver from the same famiily and further scholarships available based on financial need. Watch for another e-mail announcement when registration opens on our website. The Benji Project will again this spring offer scholarship opportunities to local individuals who want to train to teach our curriculum of mindfulness and self-compassion to teenagers. The scholarship is valued at up to $5,000. Details including an application form and deadline will be announced by email and on our website when dates are finalized. The Benji Project will hold a summer camp for teens Aug 12 to 15 at the Port Townsend Scout Cabin. Last year's camp had a waiting list, so early registration is advised. Watch for sign-up details this spring. On Dec. 14, join us for a night of comedy, champagne and dessert to benefit The Benji Project featuring Key City Public Theater’s production of “Every Christmas Story Ever Told.” Instead of rehashing a holiday classic for the umpteenth time, three actors decide to perform every Christmas story ever told in this madcap romp through the holiday season! Tickets are $65 including dessert, champagne and holiday magic. Buy yours here. Volunteers are also needed to bake desserts and work the house. If you can help, please sign up here. Scholarships valued at $5,000 each have been awarded to Teresa Shiraishi and Heather McRae-Woolf to train to become teachers of our programs. Special thanks to the Fund for Women and Girls for underwriting one of the scholarships. Teresa, a counselor at Dove House, and Heather, an educator, were chosen from a highly competitive field of applicants. The two winners are embarking on their training, which should finish in 2019. Congratulations! Drumroll please for the debut of a video about our program, produced by award-winning filmmaker, Jessica Plumb. 2018 has been an active year for our programs which served more than 60 area youth. Highlights include our four-day summer camp for girls ages 11 to 19 which. The Benji Project also offered two 8-week classes for high school students, including a girls program supported by the Fund for Women and Girls. Reunion/refresher programs are scheduled Nov. 17. We are fundraising for 2019 programs and are especially seeking sponsors for boys programs. Are you part of an organization or charity that wants to support boys? We are seeking a partner to step up and make sure boys have access to stress management and emotional resilience skills. Please get in touch. Participants and staff of Benji Camp in June. Deepest thanks to major donors in the second half of the year including Chad’s Legacy Project, Jefferson Healthcare, Ellen Ferguson, Port Townsend Kiwanis, Thomson Reuters, and Bruce R. McCaw and Jolene M. McCaw Donor Advised Fund at United Way of King County. Gratitude to other generous donors including: Sueleka Matthews, Geroge D Eseveldt, Mary Wilson, Aimee Boulanger, David Beal, Christopher Boyd, Helen Brink, Margery Helander, Donna Eldridge, Larry Dunbar, Beth Ross, Sharon Hoyer, Calah Tenney, Tina McLeese, Joe Cunningham. If you want to support our teen programs, make your donation here. award-winning documentary. This movie, which breaks the silence around suicide, is also being shown to students at Port Townsend High Schoo. Events organized by student Callay Boire Shedd. Also save the date: We are holding a camp for girls ages 11 to 14 on June 25 to 28. Teachers Lorraine Hobbs and Karen Bluth will offer an age-appropriate version of our Making Friends with Yourself course on mindfulness and self-compassion along with fun activities. Stay tuned for registration. The Benji Project is offering two scholarships for individuals to become trained to teach the Making Friends with Yourself program of mindful self-compassion for teens. See more information and an application here. One scholarship is made possible by the Fund for Women and Girls, and it will go to a woman. Applications must be submitted by April 20. The Benji Project's collaboration with the School-Based Health Centers on the Making Friends with Yourself stress management class for teen girls and grant from the Fund for Women and Girls were covered in The Leader on Jan. 17, 2018. The Fund for Women and Girls has awarded its annual grant to The Benji Project and the School-Based Health Centers. The $8,200 award will support the launch of Making Friends with Yourself by paying for local teacher training and an initial session of the eight-week class for high school age girls. (Class begins in January; See details below.) The Benji Project and SBHC under the leadership of Susan O’Brien will develop a community referral model to help teens access the program. Thank you to the Fund for Women and Girls! The Benji Project’s core program on mindful self-compassion for teens will launch in January. The initial session, supported by funding from The Fund for Women and Girls, is for high school girls and will meet on Thursdays at 3:30 p.m. in Port Townsend. The program runs Jan. 25 to March 30 with no meetings on Feb. 8 and Feb. 22. Registration is required. Further details will be posted online soon. Until then, email cynthia@thebenjiproject.org with questions or for registration information. Additionally, the course will be taught to students at Jefferson Community School over the same period. Further classes are planned later in the year. We are seeking a sponsor for a community boys’ class. Making Friends with Yourself will be taught by teachers visiting from the Seattle area in 2018, but we are working hard to cultivate local teachers. Supported by The Fund for Women and Girls, The Benji Project aims to select and award scholarships to two individuals in 2018 for training to become certified to teach MFY. An application and selection process will be announced by the spring. The Benji Project’s night of theater fundraiser at Key City Public Theater for “The Book Club Play” in October was a big success. Thank you to KCPT, the many volunteers, supporters and our honorary host, Holley Carlson of Coldwell Banker. More than $4,000 was raised. Thank you to the teens who have stepped forward to form our Teen Advisory Board. Among this board’s crucial roles will be to help select our teacher scholarship winners and advise on how to promote Making Friends with Yourself. Do you know a teen who is motivated to help others? We are accepting nominations for additional board members. Please contact cynthia@thebenjiproject.org for details. Karen Bluth, the co-creator of our Making Friends with Yourself program, published “The Self-Compassion Workbook for Teens” in November. It offers valuable tools and exercises based in mindfulness and self-compassion and is a great adjunct to our live classes. By purchasing your copy via our link to Amazon, you help support our programs. The Benji Project will in 2018 donate copies to local schools, organizations and libraries to make this resource available in the community. If you would like a copy for your organization, please contact cynthia@thebenjiproject.org. PTHS student Callay Boire-Shedd is organizing screenings in February of “The S Word Movie,” which played at the PT Film Festival and breaks the silence around discussing suicide. Filmmaker Lisa Klein will attend. As part of the events, a fundraiser screening for The Benji Project will be held at the Starlight Room on Feb. 8. Further details to come. Thank you to all who have donated in the fourth quarter. Every donation is meaningful. There are lots of developments at The Benji Project including upcoming events for adults and teens, progress on non-profit status, and the formation of a youth advisory board. Read on to learn more. FOR ADULTS: SUPPORTING YOUTH WITH MINDFUL SELF-COMPASSIONA 1-1/2 day workshop will be held Aug. 26 and 27. Co-creators of the Making Friends with Yourself program Lorraine Hobbs and Karen Bluth will introduce parents and professionals to helping teens navigate adolescence with self-compassion. CE credit will be available. Read more here. A half-day workshop for youth ages 11 to 19 about mindful self-compassion will be held on Aug. 27 in the afternoon. Instructors Lorraine Hobbs and Karen Bluth will give teens an overview of mindful self-compassion and offer simple meditations, tools and exercises to build self-compassion. Teens interested in joining The Benji Project youth advisory board (see details below) are requested to join this program. Read more here. Learn more about how to become a teacher of mindful self-compassion for teens and volunteer opportunities with The Benji Project at this event on Aug 27 at 5:30 p.m.. Lorraine Hobbs and Karen Bluth will explain the certifications and experience necessary to lead the Making Friends with Yourself Program. The Benji Project hopes to support the development of local teachers for the Port Townsend program. The Benji Project also needs help with fundraising, publicity and other activities. Get the details here. Do you know a youth ages 11-19 who likes helping other teens? The Benji Project is forming a youth advisory board to help spread the word about our mission and to offer guidance to The Benji Project on the best ways to bring mindful self-compassion programs to the youth of Port Townsend. The youth advisory board will meet two to four times a year with possibility of further volunteer involvement. If possible, youth advisory board members are requested to attend the half-day workshop on Aug. 27. If you or someone you know is a good fit, please email cynthia@thebenjiproject.org with name, age, phone number and email address. The Benji Project aims to launch the core program on mindful self-compassion for teens in the autumn. The program will be run once a week for eight weeks and is open to ages 11 to 19. Dates and times have not been determined yet. Email cynthia@thebenjiproject.org if you want to suggest a time. The Benji Project will hold one-day retreats – Oct 28 for boys and Oct 29 for girls – for teens to attend with a parent, caregiver or other key adult. This program is focused on guiding parents and teens toward treating each other and themselves with more kindness as the youth goes through adolescence. Activities and discussion on such topics as: What I wish my teen/my parent knew about how I am feeling. What it’s like to be me. How can we develop ways for greater understanding and communication. Registration and more details will be available later this summer. The Benji Project is working towards gaining fiscal sponsorship which would enable us to accept tax-deductible donations and access more funding sources. The program would operate under the administrative umbrella of another nonprofit. Stay tuned for more updates. The Benji Project wants to make trainings available to all, but the costs are high. A fundraising committee will start work this autumn. Contact cynthia@thebenjiproject.org and let us know if you can serve. If you would like to donate, email cynthia@thebenjiproject.org. The weekend core skills workshop in March was a success with 34 registrants. Instructors Lorraine Hobbs and Tim Burnett led group meditations, exercises, journaling and discussion. If you weren't able to attend this workshop and would like it to be offered again, let us know. We might repeat it if there is enough demand. Cynthia spoke about mindful self-compassion and The Benji Project at Quimper Unitarian Universalist Fellowship on June 25. You can listen or read the talk here. Clothing sale fundraiser a huge success; The Benji Project is on its way! Exciting news! The Benji Project’s fundraiser was a huge success. We raised three-quarters of our goal. Woohoo! Thank you to everyone who shopped and supported us. We are lucky to live in such a caring community. The Benji Project's first fundraiser was featured in the Port Townsend Leader.